That can happen? Motherofkerbalgod!! Ye'r in a dangerous place m'friend! I started playing again last week. (A new campaign. It's alway a new campaing.) 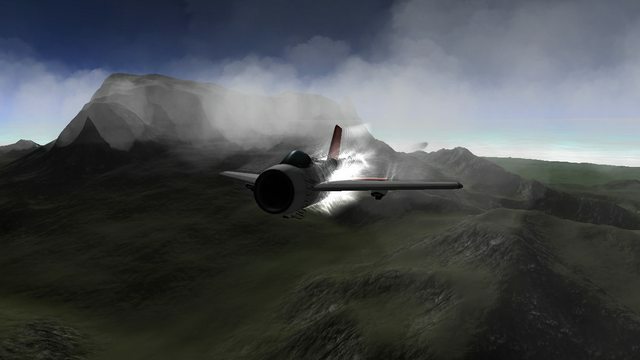 But I had to eliminate FAR (and by instance Realism Overhaul as well due to being a requisite) because my planes were turning heavily in the runway no matter what, becoming impossible to control or take off. It doesn't seem to do anything anyway so I didn't care too much, but I didn't want to eliminate the other stuff. I had Real Solar System (which I don't like) because it was impossible to use Remote Tech otherwise, but conducting a survey (probably my favorite kind of contract, always it's below some altitude and not above, because those can't be achieved with early planes as far as I know) in a real scale world at fifty meters per second would have been a matter of expending the full night flying around so I eliminated that too. The result? A better and smoother experience now with all the other realistic stuff still there, including Construction Time, Real Fuels and TAC. I remember to post here that I wanted to have to pay for using specific parts after research, and they added that, so I may be lucky again with this. Who knows. Your graphics look so much shinier than mine, Etsu. 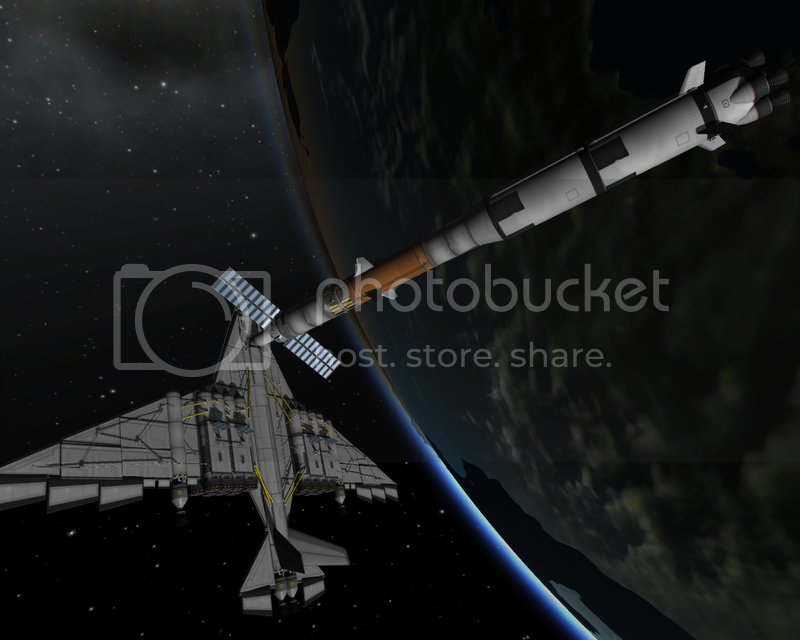 Also, Thomdon Kerman is now in orbit.... And his bird is an absolute beast! Just need to get it refuelled and he'll be ready to go places. 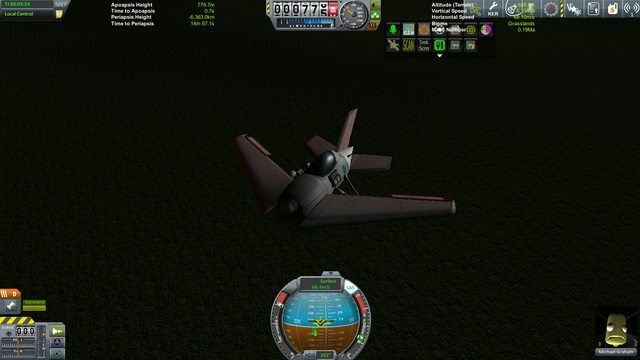 There is a recovery cost, if you land somewhere != KSC you get less than the full worth of your equipment back. HowSerendipitous wrote: Your graphics look so much shinier than mine, Etsu. 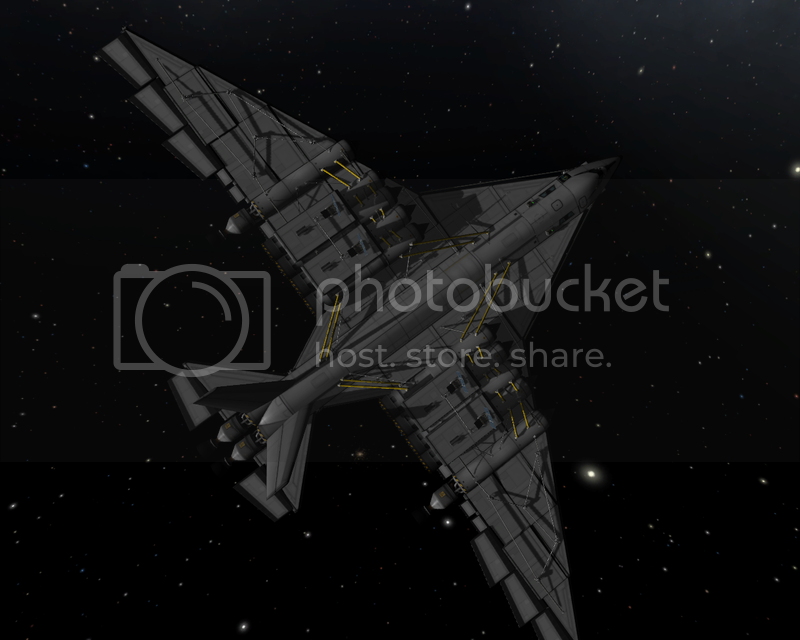 The first pic was using Real Solar System, and that may be why the terrain looks different. Cornflakes_91 wrote: There is a recovery cost, if you land somewhere != KSC you get less than the full worth of your equipment back. I didn't know that. May justify returning your planes if the difference is big enough. However, you still will want to recover your craft. Having to pay for it would change that dynamic I think. Etsu wrote: However, you still will want to recover your craft. Having to pay for it would change that dynamic I think. The unrealistic part is that you can recover 100% of your craft's worth. And if you had to pay more than the recovery of the craft gives you, why do it? Cornflakes_91 wrote: And if you had to pay more than the recovery of the craft gives you, why do it? If those parts have scientific data, of if building new ones becomes too expensive. (Using Kerbal Construction Time.) If the cost is still too much, well great. Then you have a good reason to conduct recovery operations yourself and it's an incentive to try to land close to the Kerbal Space Center anyway. 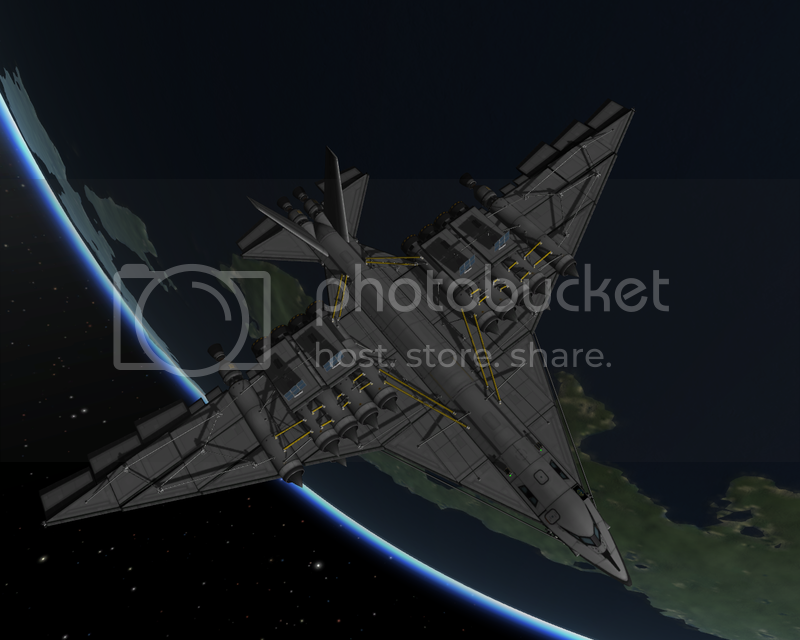 So I got a nice juicy refueller ship up to Thomdon's plane. It's now fully loaded up. I reckon it's got enough to go to another planet, assuming I don't do anything stupid. I also popped a satellite in there, you know, because it'd be nice. So, any suggestions where to? Duna or Eve? I suspect Duna is the more feasible of the two and less likely to result in a horrible death. HowSerendipitous wrote: So, any suggestions where to? Duna or Eve? I suspect Duna is the more feasible of the two and less likely to result in a horrible death. Thus Eloo is the obvious choice. 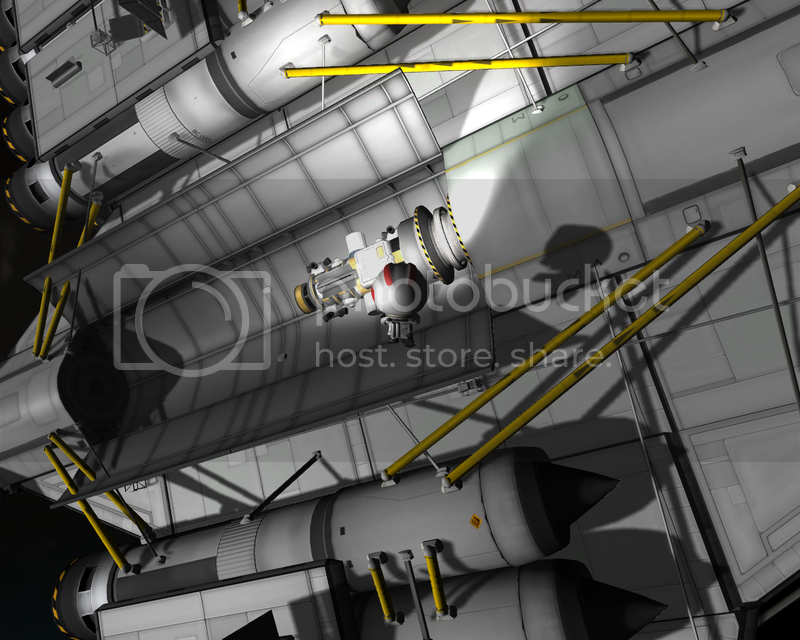 This is not the 1.1 version that will bring Unity 5 to Kerbin. It's just a generous series of improvements and new parts, but still very cool. What does the roadmap for KSP look like? What can I do in the current version which I can't do in the demo? 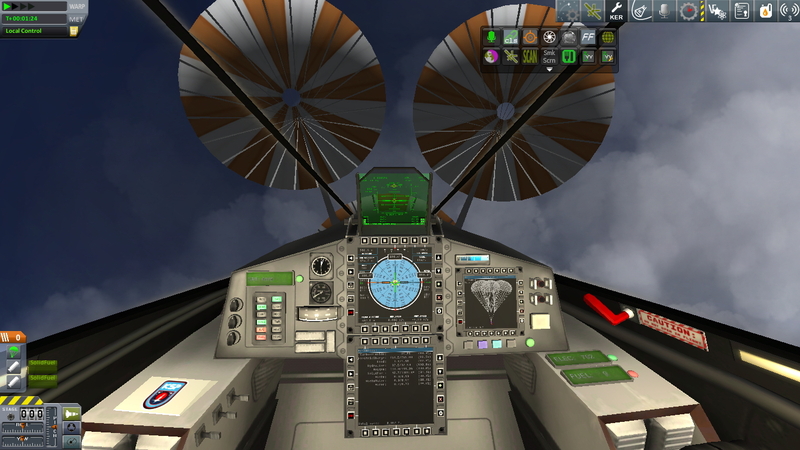 (In the demo I was able to get a ship into orbit around earth and then get another ship to the moon.) Is there mining, or some way to manage expenses? How does the multiplayer play like? Is multiplayer structured into game types or is it similar to a sandbox? BFett wrote: What does the roadmap for KSP look like? What can I do in the current version which I can't do in the demo? Multiplayer is planned for later. Last edited by Cha0zz on Mon Nov 09, 2015 1:41 pm, edited 1 time in total. BFett wrote: How does the multiplayer play like? Is multiplayer structured into game types or is it similar to a sandbox? theres a mod that somewhat adds multiplayer, but thats hacky and buggy as hell. Okay, thanks for the quick responses. I may pick it up during the Christmas sale. Hopefully they'll have the next patch out by then. So I got back into the game after all this patching and release and stuff, and wow I'm surprised. Atmospheric model changed a ton - I used to be good at sending Remote Tech + Deadly Reentry probes to Duna and Eve, but suddenly my early-game craft are having a huge lawn dart rate. We make it past the thermal hazards fine, me, my 1.25 capsule, service box, crew cabin, heat shield, and three parachutes. Then the ground rushes at us with speeds still too high to pop chutes. Well, not all the time. Sometimes we make it, which is all the more confusing. All this from 80k LKO, 35k initial periapsis, and a 40-unit detachable heat shield. What am I missing? Descent too steep? Not steep enough and I get hung up in high alt too much? Is my craft too heavy for its cross section?